Did You Know Your Dentist Can Treat Sleep Apnea in Canton? Did you know that 18 million Americans have sleep apnea? For a lot of people, the first time they realize they have a sleeping disorder is from talking to their dentist. Surprisingly enough, your oral health could be to blame for your trouble sleeping. Many people have untreated sleep apnea because they don’t know the symptoms. Keep reading to learn what this disorder is, what symptoms you should look out for, and what your dentist can do for your sleep apnea in Canton. Sleep apnea is a potentially serious sleeping disorder that makes your breathing stop and start during sleep. The most common type of this disorder is obstructive sleep apnea (OSA). This occurs when your throat muscles randomly relax and block your airway during sleep, causing you to stop breathing repeatedly. 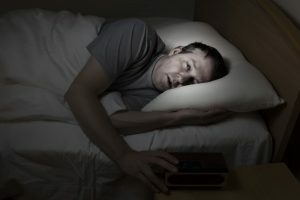 Grinding and clenching teeth at night is often the first sign of sleep apnea. This disorder can affect anyone at any age, but your risks are higher if you’re male, overweight, above 40, have a large neck size, and have a family history of sleep apnea. These are the most common symptoms of sleep apnea. If your significant other or family members notice you are snoring loudly or that you are constantly waking up during the night, talk to your dentist about treatment options. Your dentist can create a custom intraoral appliance, made of comfortable plastic, that repositions your jaw to leave your airway open while you sleep. This has become a popular alternative to the CPAP machine (continuous positive airway pressure machine) because it doesn’t make noise and is easy to travel with. Because grinding and clenching your teeth is a cause of sleep apnea, another treatment your dentist may recommend is wearing a nightguard. A custom-made nightguard from your dentist can help with your grinding, which will alleviate other problems like headaches and jaw pain as well as give your sleep apnea some relief. Whether you think you have sleep apnea or not, if you’re having trouble sleeping, talk to your dentist about what you think could be causing it. Dentists today are well versed in sleep apnea and its treatments, so discuss your sleeping problems with them to prevent more serious issues down the road. Dr. J.D. Robison has taken hundreds of hours of training to not only help your smile, but to also treat sleeping disorders like sleep apnea. He takes pride in helping his patients feel better through a good night’s sleep. He currently runs his own practice, where he can be contacted through his website or by phone at (734) 453-6320. Comments Off on Did You Know Your Dentist Can Treat Sleep Apnea in Canton?